Carousel Cream Center Extruder & Cutter- Savage Bros. 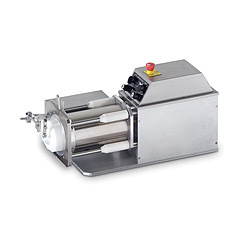 The Carousel Cream Center Extruder & Cutter helps the artisan candy-maker to shape and size ganache and cream based centers before dipping or enrobing. Extrude and Cut Creams, Ganache, Fudges, Marzipan, Truffles, Cookie Dough, and More! Increase productivity of operator by more than 300% over any hand method of forming centers. Make round, oblong, egg shape, diamond, square, or heart shape, using interchangeable nozzles. Maintains uniformity of weight and shape better than any other extruder on the market. Extruder comes with one product cylinder and one 7/8" square nozzle head. Additonal product cylinders and nozzle shapes available.